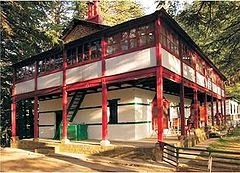 Urusvati himalayan folk art museum was established as a Research Institute in 1928 by Professor Nicholas Roerich, Urusvati Himalayan Folk Art Museum at present is a major attraction of Naggar inviting many visitors. The museum is rightly placed 100 m uphill from the Nicholas K. Roerich Art Gallery. The primary aim behind the establishment of this museum was to provide a place of study, research on Tibetan medicines, Indian traditional and the ethos of the Himalayan region. The museum was titled with a new name “Urusvati”, meaning “Light of the morning star” in Sanskrit, in the year 1993. Dedicated to the Russian folk art, the gallery also showcases musical instruments, painted dishes, stone carvings, oil paintings by Russian artists and others.In addition to a variety of traditional customs of Ladakh, Tibet, Kullu and Lahaul-Spiti, the museum also has beautifully crafted idols of Hindu Gods and Goddesses, a picture of Lord Buddha and Pahari paitings.